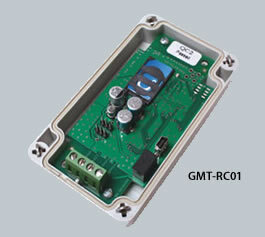 Control your automatic electric gates by telephone from almost anywhere with the GMT-RC01 remote control switch. 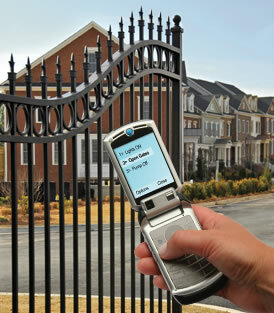 A simple telephone call (or a text message) can remotely operate an automatic electric gate system or switch an electrical device on or off - and that call is free. Any call from an authorised user's number is recognised by the GMT-RC01 Switch causing it to promptly drop the call and carry out its function. It can also send a confirmation signal that the command has been received and actioned if required. 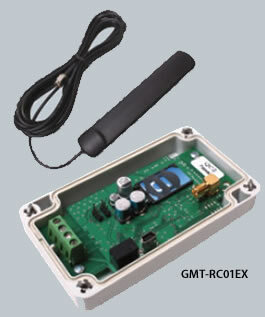 The GMT-RC01 is supplied with an internal antenna; programming cable for computer connection and a CD-ROM - while the GMT-RC01EX is supplied with a cabled self-adhesive antenna with SMA connector for flexible mounting in more complex or difficult electric gate installations. Other antenna options are available.